Credit: NASA/JPL-Caltech (view JPL Image Use Policy). Download this movie (MP4, 39.8 MB). 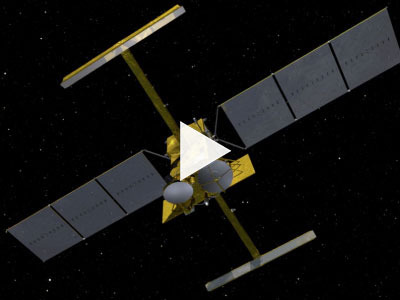 [01-Mar-16] This animation features the fully deployed SWOT satellite over Earth. Beams from the Ka-band Radar Interferometer (KaRIn) are shown in pink and green, and the altimeter signals are shown as red pulses. As SWOT orbits, a parallel pair interferometry bands of data are produced, as well as an altimeter track in the gap between the KaRIn swaths. The end of the animation illustrates the crossover and orbit that results in global coverage every 21 days.